One of the most missable trophy/achievement in the Shenmue HD re-release on the PC, PlayStation 4 and Xbox One is “What’s It Worth?”. According to the description, you can unlock it by taking “the Phoenix Mirror to the two antique shops in Dobuita.” However, a lot of players are having trouble doing so. If you are have some difficulties, you can check out our guide below. You only have a very limited time frame in order to unlock the “What’s It Worth?” Trophy/Achievement. First off, you have to obtain the Phoenix Mirror. At this point, you should not move forward with the next main objective of the story, which is to bring the mirror to Master Chen at Old Warehouse 8, as doing so will lock you out of this trophy/achievement. As a precaution, we recommend saving your game right after you obtain the mirror just in case of a possible glitch and/or you accidently advancing the story. Once you are prepared, you need to bring the Phoenix Mirror to the Bunkado Antiques and Russiya China Shop in the Dobuita area. You should be familiar with the locations for both stores at this point as you are required to visit them in the story. If you have the mirror in your possession, a cutscene will play as you enter the stores. In our playthrough, we went to Russiya China Shop first and then Bunkado Antiques. The “What’s It Worth?” Trophy/Achievement popped right in the middle of the cutscene in Bunkado Antiques. A few players are reporting that the “What’s It Worth?” Trophy/Achievement is not unlocking after visiting both stores with the mirror. If that happened to you as well, we recommend reloading your save and trying again. Hopefully, this bug will be fix in the future (as of this writing Shenmue is at version 1.0 on the PC, 1.01 on the PlayStation 4 and 1.03 on the Xbox One). 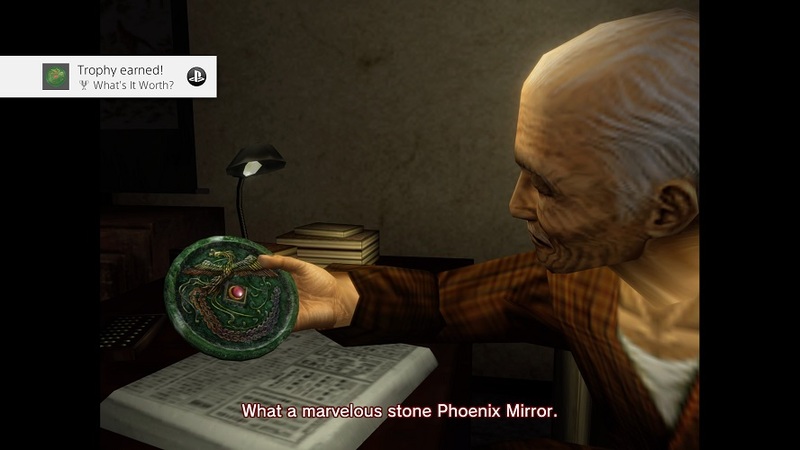 Although not required for the “What’s It Worth?” Trophy/Achievement, we recommend visiting two other people with the Phoenix Mirror if you want to learn more about the lore in Shenmue. The first is Yamagishi-san, who is usually at Sakura Park in Sakuragaoka. Talking to him will initiate a cutscene providing more information on the mirror. The second individual is Liu-san, who is normally found at Suzume Park in Dobuita. He will explain the “Father’s Heaven, Nine Dragons, Mother’s Earth, Comrades” passcode used to communicate with Master Chen via telephone.